meals go? Well, James kindly and romantically made us breakfast in our little Airbnb flat, which was super cute, but apparently I didn’t take a picture of it. There is a little snippet of it that should be in the vlog. Lunch? 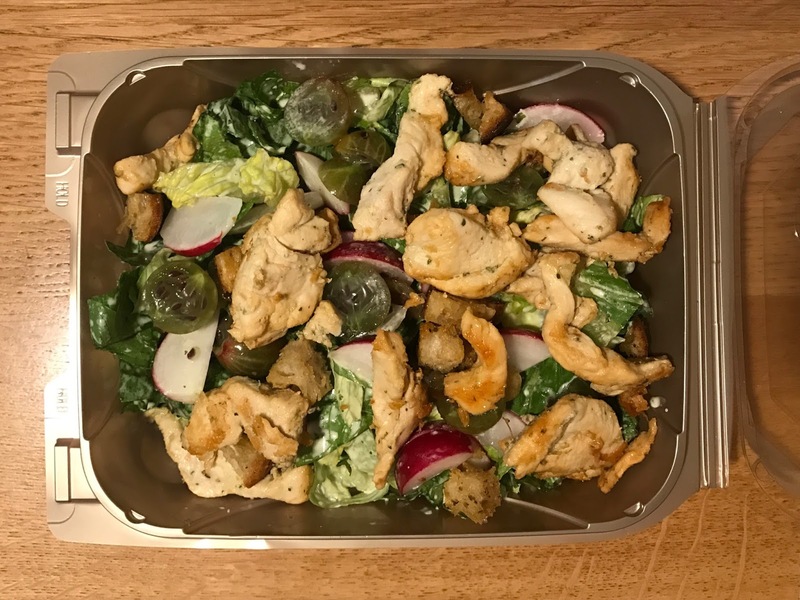 Let’s be frank, we were too busy wanting to get as many things done during the day, that we simply wanted something cheap, quick and easy – McD’s it is and there’s no shame in that, but as you can imagine it’s not the best looking thing to take pics of and write about, so here we are to the main meal of the day – dinner. After a long day of sightseeing and walking around, which you can read all about here, we were ready for a sit down dinner. 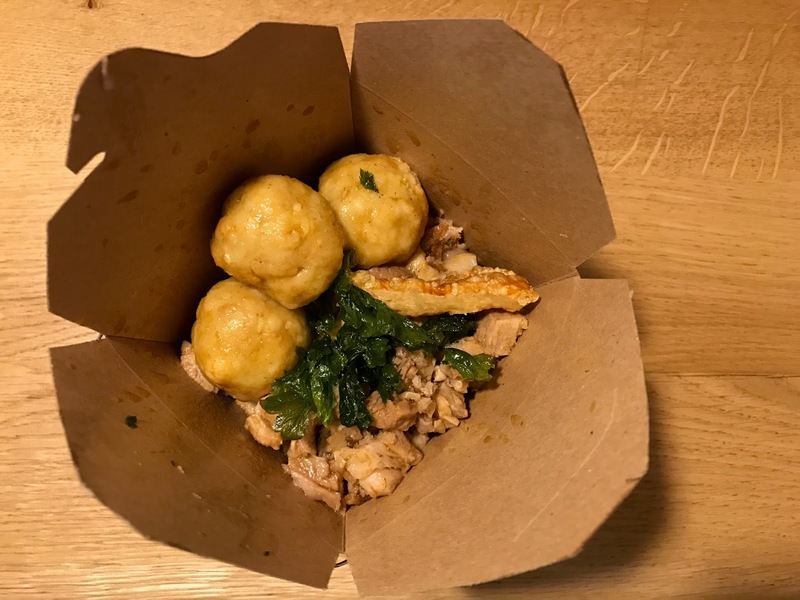 I know what you’re thinking – take-away boxes? I think it’s a part of their theme and it wasn’t all too bad. 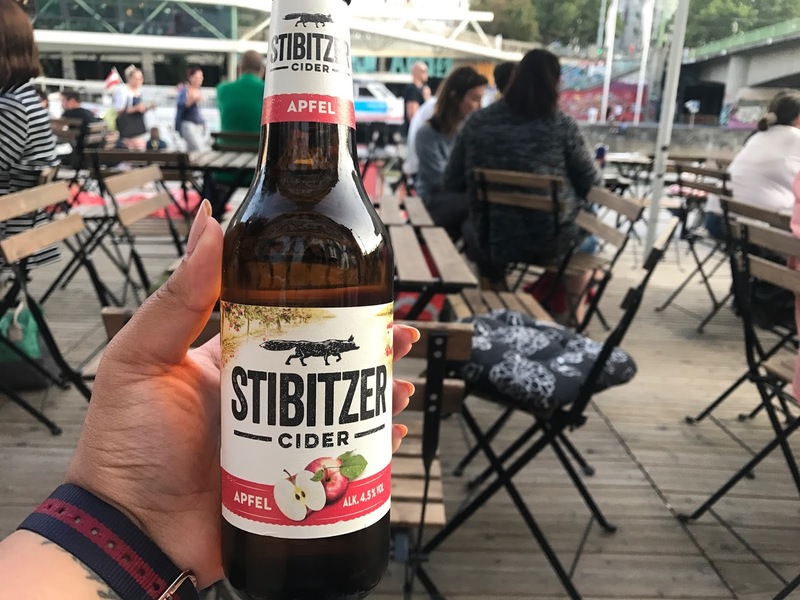 We originally came based on finding good reviews on TripAdvisor, as it was rated number 1 cheap eats in Vienna and number 4 overall in places to eat. The food was delicious! I, Jessica got the roast pork with dumplings, while James got the chicken Caesar salad. Both were served in these take away boxes, but full of flavour and the pork was so tender and juicy. James didn’t think it would fill him, but it did and with that we can’t complain. After dinner, we contemplated on what we’d do next, but food hasn’t left our mind and dessert was on the cards, but where to go? 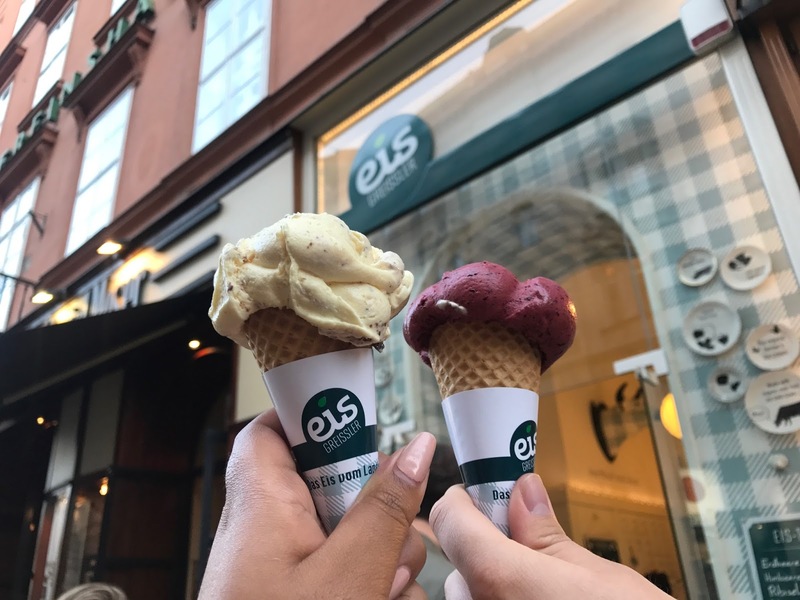 Using our trusted source, we found the best dessert place in Vienna and that was Eis Greissler. 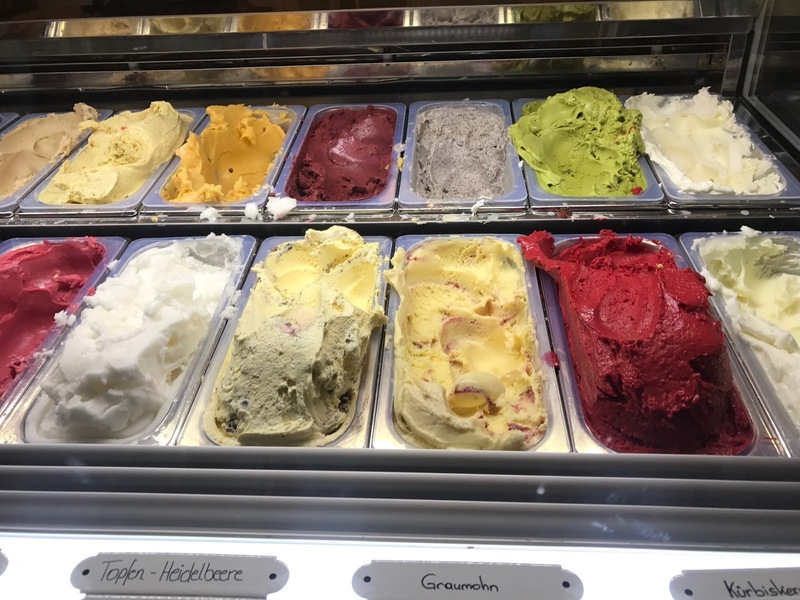 We hesitated on the fact it was Italian and not a Viennese classic, but who could say no to the best gelato in any country on a hot sunny day? We can see why this little place is so popular, although the place itself is small, the service was friendly and quick. They explained all the different flavours in English and to our surprise, they had some pretty unusual flavours too! – Cream cheese, pumpkin seeds and more. James got cranberry and cream cheese, and I got the cookies and cream, based off the recommendation of our server (it was her favourite) and both did not disappoint. To end our long day, we decided to sit by the canal and have a drink. For the first time in a while, I had a cider, while James had a beer (as if he’s not sick of it yet). We took a while drinking them, just simply sitting and reflecting on our adventures and what’s to come. Tomorrow is another exciting day, so make sure to come back to see what we’re doing! What is your typical price range for a ‘cheap eat?’ Let us know in the comments below. Everything looks so yummy!!! Those flavors of the gelato sound amazing ! Loved this post! That gelato looks amazing! I was in Vienna this last winter but I'd love to go back during the summer 🙂 Thanks for sharing!! That dinner and ice cream both look delicous! Hope you're having a great trip! I'd love to go to Vienna someday!